In the eyes of friends and relatives, Liu Fang used to have the perfect life－she was good looking, married to a loving husband, mother to two young children, and head of her own company. That was until about two years ago, when she says her world fell apart. "Autism? I had no idea what it was," the 30-year-old said. "I just thought my son was a little slow in developing the ability to speak, that's all." Her son was 2 when a doctor diagnosed him as autistic, a developmental disorder that affects a person's ability to communicate and interact with others. Since that day, Liu's marriage has verged on collapse, and she has been forced to close her company making electronic chips to cater for her son full time. "How I wished that doctor was wrong," she said, the anguish of her family's ordeal audible in her voice. In the months following the diagnosis she tried other doctors and other hospitals, but each time the result was the same. She now spends her days shuttling her son between their home in Beijing and rehabilitation centers, all the while seeing her healthy daughter acquire abilities that her elder brother, now 5, may never develop. "My little girl can screw on a bottle cap easily, but I've taught my son hundreds of times and he still has no idea of the movement," Liu said with tears in her eyes. "His progress is very slow. But at least now he has begun to speak. He understands what you say and can answer some simple questions." Despite the upheaval caused by her son's autism, she said her time spent at rehab centers has shown her she is not alone and that many parents are struggling through even worse circumstances. Li Chuanghe's daughter was diagnosed seven years ago, at age 5. 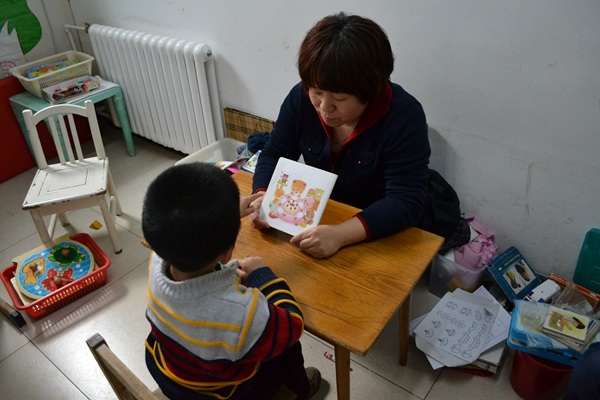 She began receiving treatment at a rehab center almost immediately and made some progress, yet not enough to prevent her from being rejected by primary schools in her native Shenyang, capital of Liaoning province.